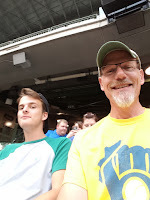 I had the chance to attend my first Brewers game of the season a couple of nights ago. I won free tickets in a drawing at work for Bike to Work Week in May. The tickets were valued at more than $60 each, so this was clearly one of the better sets of seats I've ever had. I won four, but every person we asked to join us was busy it seemed, so it was just Ben and I. This was a good thing for many reasons, the best one being that we just had some great laughs and together time, something we don't seem to get near enough of these days. Now, neither of us are big baseball fans. I literally did not know more than 1/2 the guys on the field, and Ben knew even fewer. We both admitted that watching baseball on TV - with the exception of maybe postseason playoffs/World Series - is just something we've never enjoyed. At the same time we agreed that watching it live is much different, much more engaging. But, as many of you know, attending a game is not cheap. 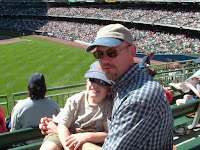 It is usually $150+ per game for a family of four after tickets , parking, snacks and a steeply overpriced beer or two. So, we typically don't get to a game unless we have discounted or free tickets. It takes the edge off a fairly expensive outing. Anyways, we went and had a blast. Our seats were right along the third baseline 20 rows from the field. It was funny, but when I went to get my tickets from the Will Call window, Ben saw me at Window #6 which said VIP Seats and said "Dad, you're in the VIP line." I said, "I know. I told you these were good seats. You don't expect us to sit with the rest of those Plebeians, do you?" 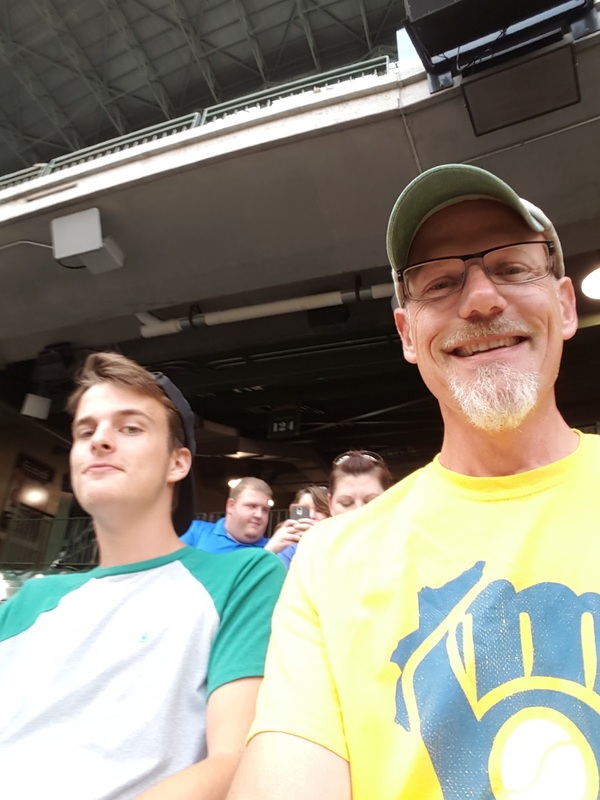 To top it off, it was T-Shirt night, so we both got Brewers T-shirts out of the deal. Thankfully the Brewers were on their game and were playing the one team that they can consistently beat, the Pittsburgh Pirates. 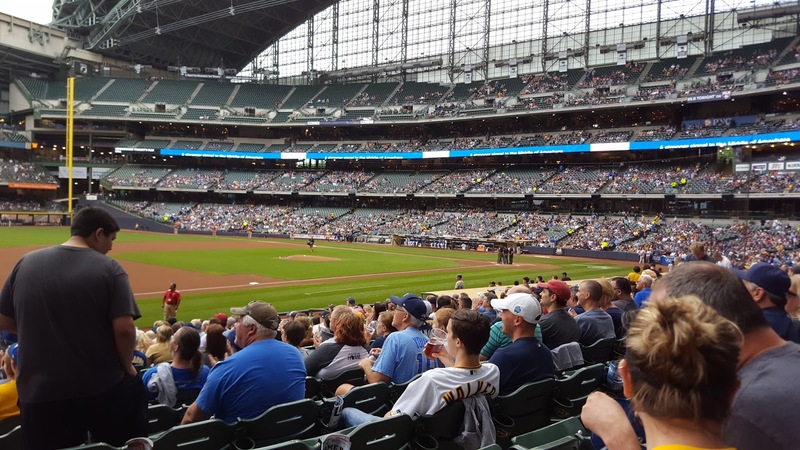 The Brewers are 4 - 2 versus opponents when they play on Tuesday afternoons when the roof is open, the temperature is above 74 degrees and both starting pitchers are left-handers from Japan. Then we talked about all of the crazy acronyms in baseball. Things like OBP (On base percentage) HBP (Hit by Pitch) BB (Base on Balls) and the ever lovable OPS (On base Plus Slugging). I thought Geographic Information Systems (GIS) had a lot of acronyms. Because he has a wicked wit, Ben can keep right up with me when we joke about sports like this. We love watching them together, especially the Packers and more recently, Admirals hockey, but when it comes down to it, these are men playing a boy's game and making millions in the process. So we look at it as our job to keep it real. I can remember showing a baseball I'd caught at Brewer's game in the 80's and we got to talking about the sport. I said that the Brewers were kind of lousy at the time and certainly not going to the playoffs to which she said, "Yes, but it's all about the game you're at. You want them to win THAT game. It doesn't matter what place their in." That always kind of stuck with me, for some reason. So the Brewers (and Twins, my other team) are going nowhere again this year, it appears. But we wanted them to win anyway. And as I said we were fortunate they played well. There was a two run homer in the first inning that gave us an early lead. Then, Junior Guerra, the Brewers pitcher pitched out of his head and ended up throwing one batter short of a complete game. Both of us were hoping they'd leave him in for the last batter, but he was starting to look shaky and giving up bases, so they pulled him. The whole decision to keep him in or pull him though, gave an interesting storyline to an otherwise nothing game. When the reliever got the final out, the stadium erupted. It was a cool ending to a great night. It was a night I was so glad I got to experience with my son.